DESIGNED BY ROBERT TRENT JONES SNR. During the last decades, Mijas Golf has become one of the most popular golf complexes in Europe, known by the outstanding condition of their courses and the friendly atmosphere and excellent service provided to the clients. The courses, Los Lagos and Los Olivos, are situated in the valley of Mijas, north of Fuengirola, only twenty minutes from the Málaga international airport and Marbella, and 3.5 kms. from the sea. Keeping the original design of Robert Trent Jones Sr., the course has been totally refurbished in 2012. The gentle outlines of Los Lagos course in contrast to the stunning appearance of our “Bridge-ball” cannot leave anybody indifferent; proving that it is possible to mix tradition and innovation on the same scenery. This bridge project was created by the local company Tegobi & Sons and the designed was developed by José González. WHY THE BERMUDA GRASS TURNING YELOW/BROWN? 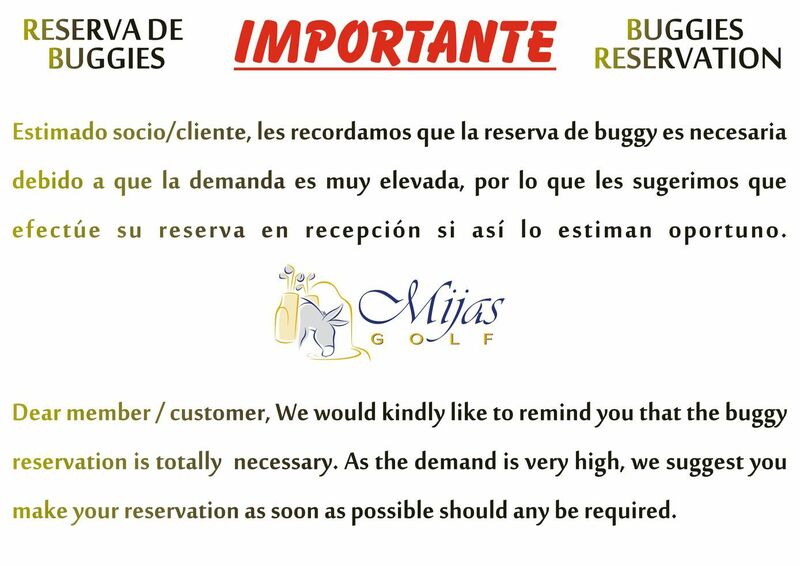 USE OF THE BUGGIES: THE 90º RULE WILL BE APPLIED ON BOTH COURSES, IF THE WEATHER CONDITIONS PERMITS IT.